"Kalimdor should be home to the orcs, Rehgar. All of Kalimdor!" "Beat them back! 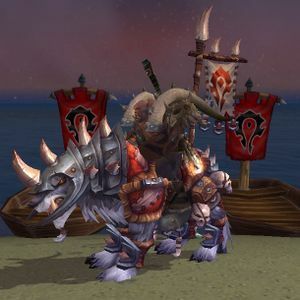 Remind these vermin what it means to assault the Horde! Lok'tar ogar!" "I will not fail you, Warchief. I will lead as well as I can, and I will consult with the advisors you suggest. I know what a tremendous honor you do me, and I will strive to be worthy of it." "You are slower than the last time we met. You are growing older, Varian. Perhaps you should let that sniveling son of yours be king. I will march on Stormwind when the kraken have reduced your mighty ships to kindling. I will take your precious boy, slap him in chains, and parade him through Orgrimmar!" 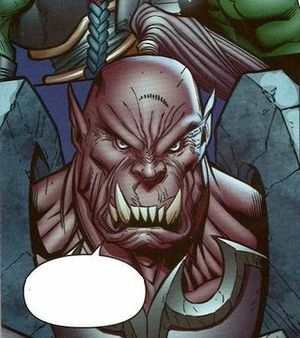 "Much has transpired since I have assumed the mantle of warchief. We have faced trials and danger, threats to our world and our way of life. And yet, we persevere. We are the Horde. We will not let anything break our spirits!" "There are some that would call us barbarians... the "mongrel races" of Azeroth. They are ignorant and blind to reality." 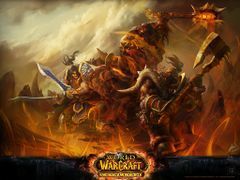 "I am the Horde's warchief, Lor'themar. And as such, I am the Horde." Hellscream's eyes are upon you. Live by these words: Lok'tar ogar. Victory...or death. Only the strongest may dwell in Orgrimmar. You will serve the Horde...or be crushed beneath it! Sends his most sincere wishes for a slow and painful death. It has come to my attention that you have deprived me of a rightful kill. 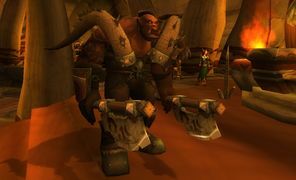 Cairne Bloodhoof was a hero to the Horde and an honorable member of a usually honorable race. It is with disgust and anger that I discover you have caused me to bring about his death through accidental treachery. Such tactics may work well for your renegade, honorless tribe and Alliance scum, but I despise them. It was my wish to fight Cairne fairly, and win or lose by my own skill or lack of it. Now I shall never know, and the cry of traitor will dog my steps until such time as I can sport your head on a pike and point to you as the real traitor. So...no. I will not be sending any truehearted orcs to fight alongside your treacherous, belly-crawling tribe. Your victory or your defeat is in the hands of your Earth Mother now. Either way, I look forward to hearing of your demise. You are on your own, Magatha, as friendless and disliked as you have ever been. Perhaps more. Enjoy your loneliness. High Overlord Saurfang说： We are surrounded... Our enemies press in from all sides, young Hellscream. High Overlord Saurfang说： The Scourge descends like locust from the north. High Overlord Saurfang说： The Alliance holds the only secure shipping lane in this region, and even that is at risk of being lost to those dreaded mists. High Overlord Saurfang说： Our only viable port for resupply is held by the Forsaken on the other side of this blasted continent! High Overlord Saurfang说： Anything our zeppelins cannot haul must be brought in by ship and travel the length of Northrend to reach us. Garrosh Hellscream说： Shipping lanes... supplies... You bore me to death! 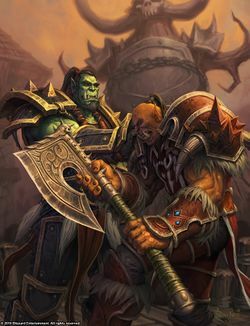 We need nothing more than the warrior spirit of the Horde, Saurfang! Now that we are firmly entrenched in this frozen wasteland, nothing shall stop us! 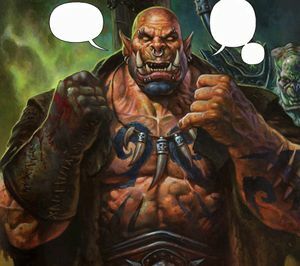 High Overlord Saurfang说： Siege engines, ammunition, heavy armor... How do you propose to shatter the walls of Icecrown without those? Garrosh Hellscream说： Propose? I will show you what I propose! Garrosh Hellscream说： There... Now we now have a shipping lane. 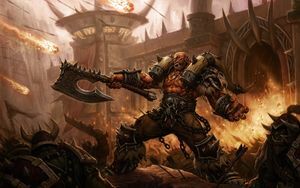 Garrosh crushes the figures and flags indicating Valgarde and Westguard Keep. 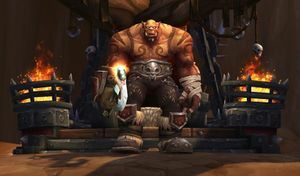 Garrosh walks back to his usual spot. High Overlord Saurfang说： So the prodigal son has spoken! High Overlord Saurfang说： Your father's blood runs strong in you, Hellscream. Impatient as always... Impatient and reckless. High Overlord Saurfang说： You rush headlong into all-out war without a thought of the consequences. 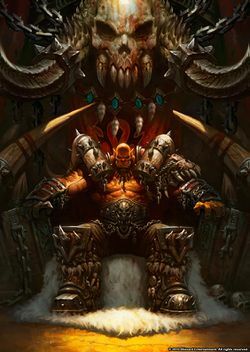 Garrosh Hellscream说： Do not speak to me of consequences, old one. High Overlord Saurfang说： I drank of the same blood your father did, Garrosh. 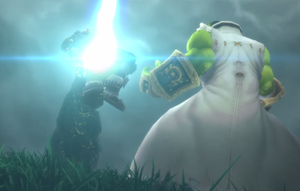 Mannoroth's cursed venom pumped through my veins as well. High Overlord Saurfang说： I drove my weapons into the bodies and minds of my enemies. 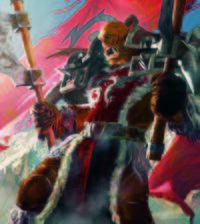 High Overlord Saurfang说： And while Grom died a glorious death - freeing us all from the blood curse - he could not wipe away the terrible memory of our past. High Overlord Saurfang说： His act could not erase the horrors we committed. 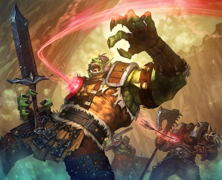 High Overlord Saurfang说： The winter after the curse was lifted, hundreds of veteran orcs like me were lost to despair. High Overlord Saurfang说： Our minds were finally free, yes... Free to relive all of the unthinkable acts that we had performed under the Legion's influence. High Overlord Saurfang说： Have you ever been to Jaggedswine Farm? When the swine are of age for the slaughter... It's that sound. The sound of the swine being killed... It resonates the loudest. Those are hard times for us older veterans. Garrosh Hellscream说： But surely you cannot think that those children were born into innocence? They would have grown up and taken arms against us! 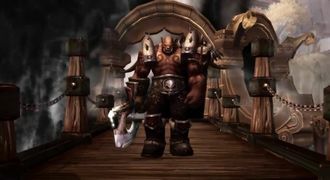 Garrosh Hellscream说： How have you managed to survive for so long, Saurfang? Not fallen victim to your own memories? The chest containing the Heart of Y'Shaarj is being transported out of the Big Blossom Excavation. The Kor'kron watch as Garrosh is inspecting its contents. 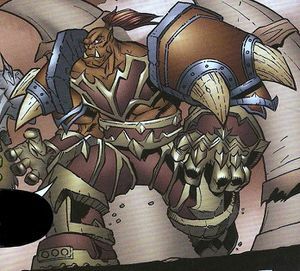 Garrosh Hellscream: Hmm... It thirsts. Bring it to the pools. The battle between Garrosh's armies and the defenders of the Vale rages as the drawbridge is lowered to the Pools of Power platform. Garrosh marches onward with the chest containing the Heart of Y'Shaarj, but is intercepted by Taran Zhu. Taran Zhu: ENOUGH! You have run rampant for far too long, Hellscream. But that stops now! 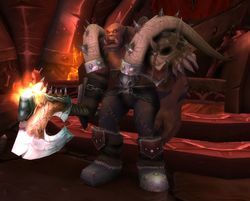 Garrosh Hellscream: Step aside, pandaren. You confront a force beyond reckoning. Taran Zhu: Your father dabbled in powers "beyond reckoning". Where is he... now? 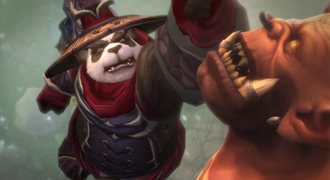 Angered, Garrosh charges at Taran Zhu, and a fierce fight between the two breaks out. Taran Zhu uses his weapon to grab Gorehowl and toss it to the other side of the bridge then looks back and gets punched across the jaw, knocking him through the chain acting as a guardrail and off the bridge. As he falls towards the pools, he keeps his eyes closed and focuses on keeping calm. His foot touches the water and ascends to deliver an uppercut back at Garrosh. He then lands on a bridge post as his blow throws Garrosh back to the chest. 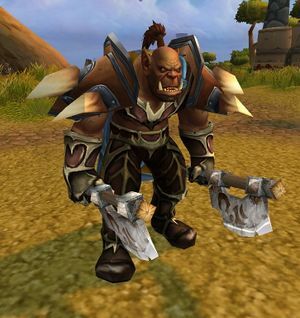 Taran Zhu: I have fought besides the tauren, trolls and others. Taran lepas high into the air. Taran Zhu: YOU are nothing like them! 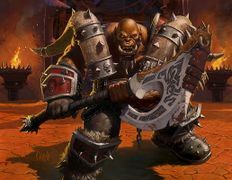 Garrosh dodges Taran Zhu's attack and grabs Gorehowl while the Shado-Pan's foot breaks through the planks and becomes stuck. 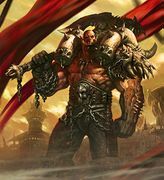 Before he can pull it free, Garrosh snatches up the broken length of chain and using it as a whip, catches Taran Zhu around the neck, choking him. 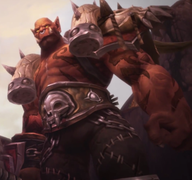 Garrosh Hellscream: They are no longer part of MY HORDE! Garrosh yanks Taran Zhu to himself and impales him on Gorehowl. Taran Zhu gasps then groans in pain, coughing. Garrosh Hellscream: Yes... I'm counting on it. 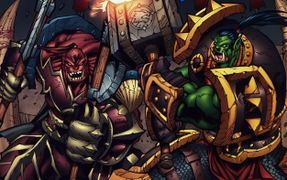 Visions of the armies laying siege to Orgrimmar flash before Garrosh's eyes, as well as his decisive victory over the invaders, impaled carcasses decorating Orgrimmar's gates. 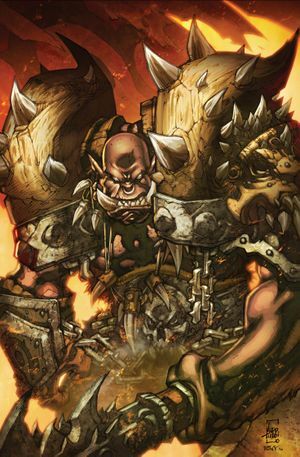 Garrosh Hellscream: The armies of the world WILL come for me, and within my fortress they will face all the terrible creatures I have wrought. Garrosh Hellscream: The boundless power I have mastered. And one by one, they will fall at my feet. 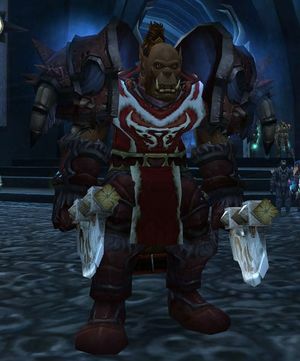 Garrosh Hellscream: Anyone who would rise against my new Horde will be IMPALED upon the spires of Orgrimmar! 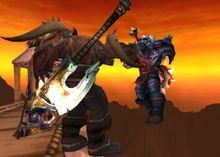 Taran Zhu is dropped to the ground in front of the 'well' by Garrosh. Weakened from his wound, he glances over at him. 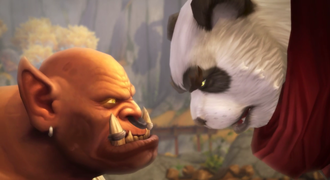 Garrosh Hellscream: You pandaren try to bury your hate and your anger. But such power cannot be contained. It. Must be. UNLEASHED! 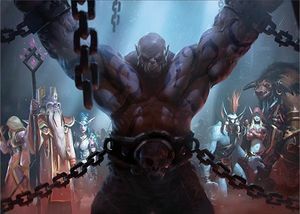 Garrosh breaks the chains sealing the chest containing the Old God's Heart, which beats malevolently. Taran Zhu sees a butterfly pass near it, becoming corrupted and dying. Taran Zhu: A time will come when you will answer for your crimes. 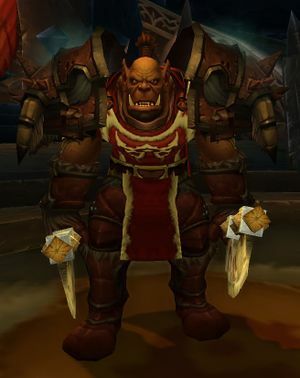 Garrosh Hellscream: I answer... to NO ONE! Garrosh pushes the chest over, dumping the Heart into the Pools of Power followed by the empty container. The Heart of Y'Shaarj corrupts the Vale of Eternal Blossoms, unleashing the Sha energies and the final Sha prime, which represents Pride. Garrosh walks back across the bridge as massive eruptions of Sha energy blast in to the sky. Garrosh Hellscream: All who challenge me will burn in the fires of my hatred. ↑ Wolfheart ... "set in the aftermath of the cataclysm"
↑ Jaina Proudmoore: Tides of War Page 27. ↑ Sean Copeland on Twitter (2014-08-18). 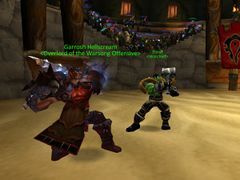 ↑ BlizzCon 2011 - Blizzard Publishing: So What's The Story?